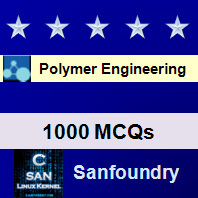 This set of Polymer Engineering Interview Questions and Answers focuses on “Multichain Step – Growth Polymers and Molecular Weight Distribution in Multifunctional Systems”. 1. What is the molecular distribution breadth for polymerization reaction of trifunctional monomers, if the conversion is 90%? Thus, distribution breadth is 1.344. 2. Hydroxyacid is allowed to polymerize in the presence of another trifunctional monomer containing carboxylic groups. What kind of structure is formed at the end of the reaction? Explanation: At the end of the reaction only branched structure is formed and no cross-linked structures can be formed since no bifunctional hydroxyl monomers are present to combine the branches. 3. Which of the following monomer molecule’s presence could lead to the formation of cross linking polymer, when hydroxyl caproic acid and carboxyl acid monomers (f>2) are polymerized together? Explanation: Glycol is a bifunctional monomer having hydroxyl groups which will establish cross-links by combining two branches. 4. How does weight fraction distribution vary with increasing functionality at constant conversion? Explanation: The weight fraction distribution broadens with increasing functionality at comparable conversion values. 5. What is true about the branching system involving trifunctional monomers? Explanation: The weight fraction of the monomer is always greater than any of the other species and the weight fraction of larger species being lower, progressively, in such a gelling system involving trifunctional monomers. 6. How does the weight distribution vary with increasing conversion and constant trifunctionality? Explanation: The distribution broadens as the extent of reaction is increased, keeping the functionality same. 7. At 100% completion of reaction, only gel is present and the distribution breadth, Xw/Xn becomes infinite. State true or false. Explanation: At p=1, the whole system is converted into an insoluble and infusible mass of one giant molecule and distribution breadth becomes equal to unity. 8. Which is the correct expression for number average degree of polymerization for the non-linear multi-functional systems? 9. 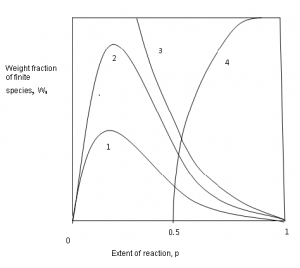 Before the interaction of W3 and W4 curves in the given figure, the system consists of most weight abundant species. State true or false. Explanation: The gel formed comprises of the most weight abundant species, beyond the intersection of the the curves W3 and W4. 10. What is the weight average degree of polymerization for non-linear trifunctional system, if the conversion is 0.3? Substituting the values we get, Xw as 3.25. To practice all areas of Polymer Engineering for Interviews, here is complete set of 1000+ Multiple Choice Questions and Answers.